Facebook Messenger wants you to share locations with friends, however, this will only be possible for one hour. The social networking giant has today confirmed that the Facebook Messenger app will from now henceforth allow the more than 1 billion people using it to share live locations. This means that you can now tell your friend where you are by simply sharing your current location via the app. However, this sharing will only be active for an hour after which it is automatically terminated. Still, you can manually terminate it at your own discretion. The feature is currently rolling out to the masses across the globe on both Android and iOS. Using a pin on a map, it will now be easier to coordinate with your Facebook Messenger pals by easily determining their location. There’s no limitation as to the number of people to share a location with. Be it Android or iOS, you only need to tap on the location icon when inside a message and sharing will be on. A map will show up with your current location on it as well as an option to share it live. Just so as you know the time remaining, there will be an indicator showing you the duration that you have been sharing your location. As noted earlier, the new feature on Facebook Messenger will be a helpful tool when trying to coordinate meetings with friends. To make this even more fun, Facebook has included an estimate of the duration of time it would take before meeting friends if making the trip by car. Like your location, this ETA is also shared with friends. 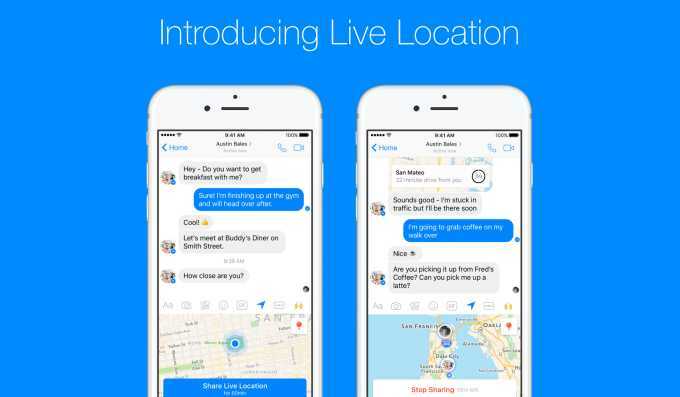 Since Facebook Messenger is used by more than just individuals, this live location sharing feature will also be helpful to brands. For instance, if you want to purchase something from a store and you are unsure about their location, a simple chat with the brand’s agent will let the latter share their location (or the one close to you) in a nick of time. According to Facebook, sharing your location in Messenger is completely optional, with the user always in control.